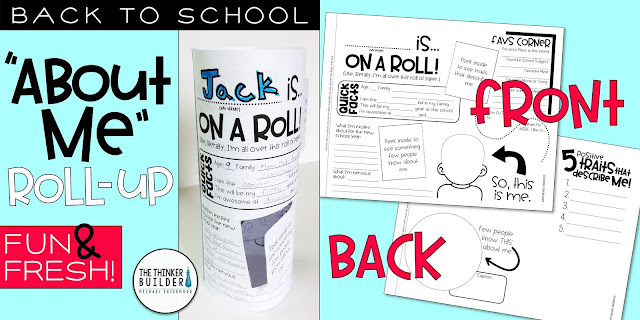 Looking for a fun and fresh "About Me" activity for back-to-school? 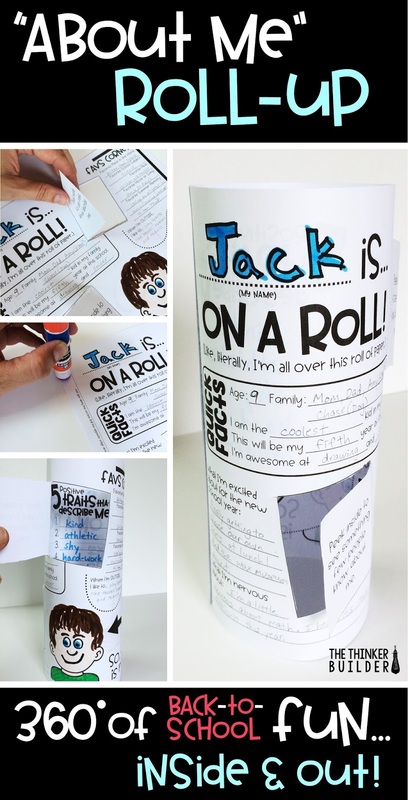 This "About Me" Roll-Up gives students a chance to share a ton about themselves in a unique, interactive, and space-saving display. Classmates and visitors can see all the info by turning the roll-up around AND peeking through the cut-out windows! Let me show you how it works. First copy the two pages front to back. Have students fill out all the sections. The front side includes "quick facts," a "favs corner," space to tell some activities they enjoy, space to tell what they are excited about and nervous about for the new school year, and a self portrait. 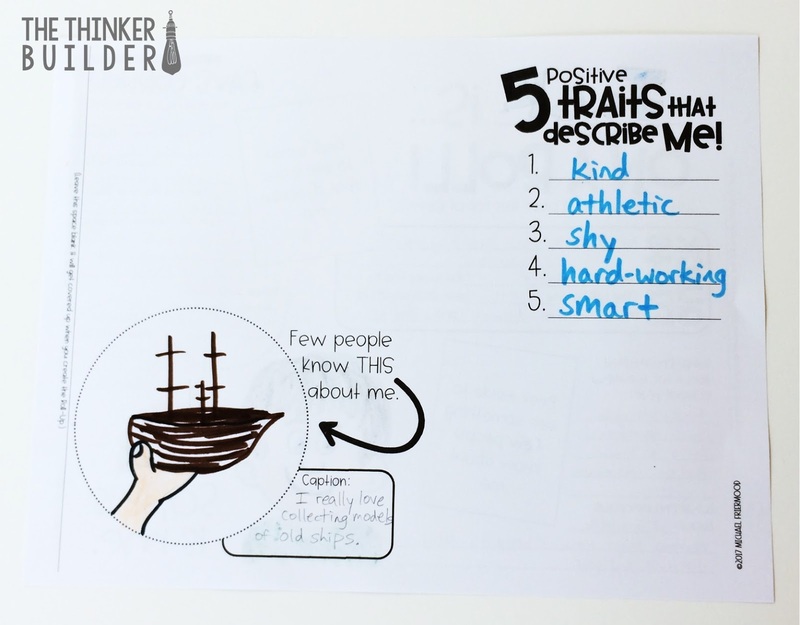 On the back, students record five positive traits about themselves, and fill out a picture and caption for something few people know about them. Once the paper is rolled up, these two sections will only be seen through the the peek-through windows. Next, students cut open their peek-through windows. They leave one side attached to create a flap to fold open. Now the roll-up is ready to... roll up! Students add a little glue to the edge section and attach the sides together. The sections on the inside line up just right with the peek through windows to make a fun little surprise for the viewer. 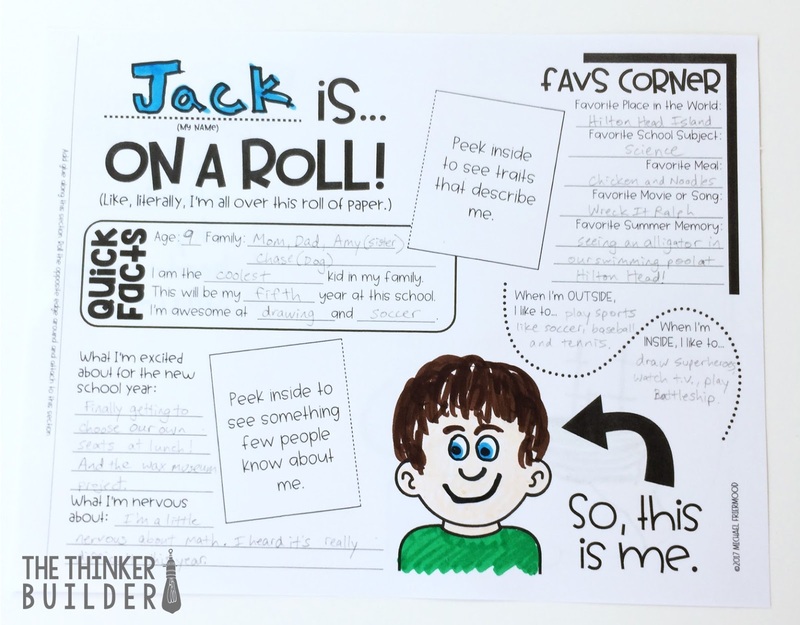 Stand the "About Me" Roll-Ups on the corner of students' desks for a perfect display piece for Back-to-School or Meet-the-Teacher Night. Or simply use them for a gallery walk for your own class to get to know each other. 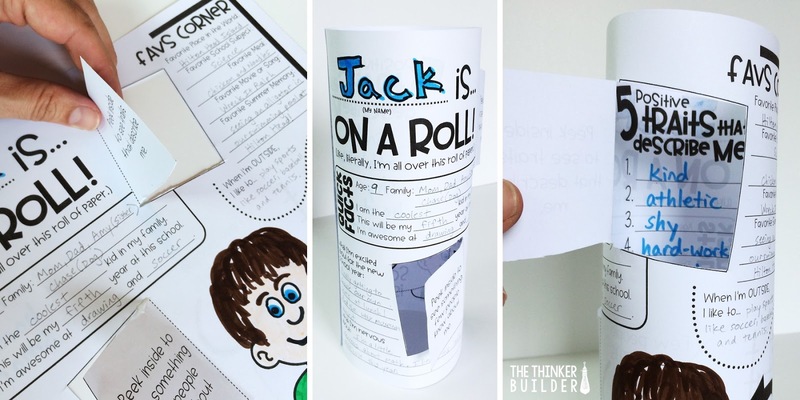 You can get this ready-to-go activity from my TeachersPayTeachers store right HERE, complete with the printables you see in the photos, as well as student directions and teacher tips. Or, you can download my free blank templates for students to design their own roll-ups, right HERE. Click the pic for details on how to purchase the activity from my TpT store. You might also be interested in more of my popular Back to School Activities. You can check out Pack #1 HERE and pack #2 HERE.